Fri., July 7, 2017, 5:46 p.m.
As the Seattle Mariners step heavily into a growing crisis of their own making, their season having reached a “critical” juncture – the manager’s word – here’s an important factor to keep in mind. For better or worse – and lately, the emphasis has been heavily on the worse – these are the Mariners. What you see (when you’re not covering your eyes) is what you get. And therein lies the problem, one that continued to mount Thursday with a 7-4 loss to the A’s. “We’re better than this,” Servais said after their eighth straight loss at home knocked the Mariners five games under .500. But are they? Servais also said this: “Your record is what you are.” And right now the Mariners are a feeble, mistake-ridden unit. For much of the year, the M’s were able to dream of a time when their injured players returned and the rosters was once again flush. It was something to get them through the rough patches. But now the would-be saviors are already back on board, and thus far not looking much like the deliverers of salvation. The trade deadline might offer some help, but that’s three weeks off, and the crisis point is now. The message Servais is not-so-subtly trying to deliver is that these players, here and now, must find a way to keep the season from slipping away. And he didn’t want to hear about how the wild-card race remains within sight, a result not of their prowess but of the American League’s cluster of mediocrity beyond the streaking Astros. That parity might keep them in technical contention even as they endure a maddening stretch of home failures, but it won’t serve them well in the long run, as Servais sagely recognizes. For this team to regain the title of “contender,” in more than de facto form, they must show far more than they have in a stretch of nine losses in 11 games. And it’s not a pretty place to be. Two of their stars – Robinson Cano and Nelson Cruz – are hobbled with leg injuries. Mitch Haniger, who had a WAR (Wins Above Replacement) equivalent to Mike Trout when he went on the disabled list in late April, had been less than a .200 hitter since his return before getting a double and a homer on Thursday. And up and down the lineup, Servais doesn’t see the same quality of at-bats that marked one of their signature wins, a come-from-behind victory over Justin Verlander and the Tigers. “I look at the Verlander game, he was dominating us. But the quality of our at-bats, even though he was striking out a lot of our guys, we had seven-, eight-, nine-pitch at-bats. You kept looking at the pitch count, and there’s no way the guy is going to finish the game against us. We’ve just got to get him in the stretch, get something going. That’s microanalysis. In the macro world, the bottom line is that the Mariners are greatly underachieving at a point when general manager Jerry Dipoto is making his final assessment of how to approach the trade deadline. 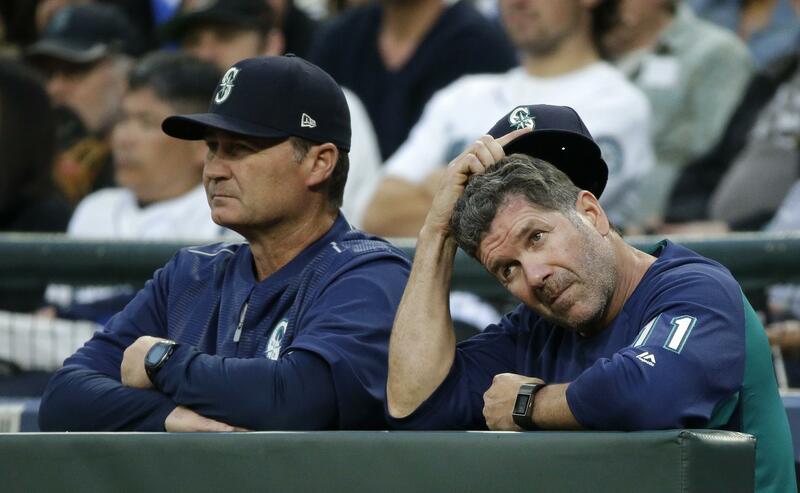 With an aging core (most of which is virtually untradeable) and the ongoing pressure to end their playoff drought, it’s hard to envision any fire-sale scenario by the Mariners. But if this slide continues much longer, they would conceivably look to trade off some veteran pieces, if not something more drastic. More likely, though, they’ll hope to weather this critical juncture and stay close enough to be a factor if and when they turn it around. Servais sees some hope – and precedent – in their rebound from a 2-8 start and from other dips along the way. None of the surges have been sustainable, however. That’s a sobering assessment for a team that has Felix Hernandez and James Paxton in its rotation. But Hernandez is no longer the ace he used to be, and Paxton isn’t yet the ace he might be. Considering the leading scoring team in the majors, Houston, is averaging 5.7 runs a night and the Mariners are at 4.8, that’s a big ask. But right now, the Mariners have to be grandiose in their expectations, because a season is at stake. And it’s slipping away fast. Published: July 7, 2017, 5:46 p.m.